Quiroga Serif Pro is an award winning and unique text typeface created by Fernando Díaz and published by TipoType. With its light modulations, great legibility and careful spacing, Quiroga Pro family comes in three styles (Regular, Demi & Bold with complementary italics). Just perfect for your editorial projects! 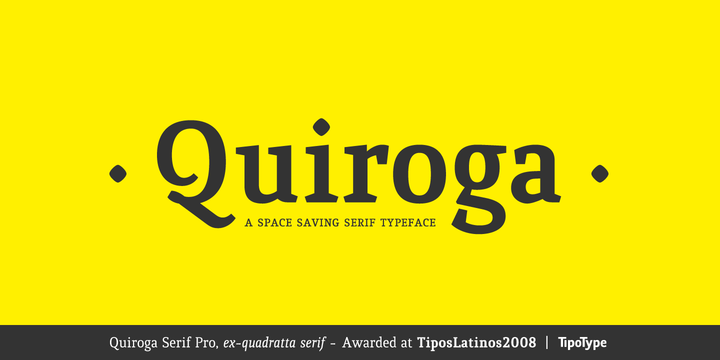 Note: “Quiroga Serif Pro” name is a trademark of TipoType. A font description published on Wednesday, September 25th, 2013 in Fonts, TipoType by Alexandra that has 3,870 views.